As I’m sure by now all of you are aware, we have been running a Kickstarter campaign this month to raise the funds necessary to print the first run of the Foggy Frog and the Pain Gang picture book. We now have just over 4 days left to raise the $3,219 we still need to reach our target. Running a Kickstarter campaign is not the easiest thing to do, even when you are 100% healthy and have all the time in the world. With several chronic illnesses, limited energy and multiple doctors and specialist appointments, this last month has been extremely challenging for me as the coordinator of this campaign. In future posts I’ll talk about the steps I’ve taken during this campaign (and those I would’ve taken if I was doing it all over again) to ensure a good balance between looking after myself, reaching our goal, and still managing to have a life. 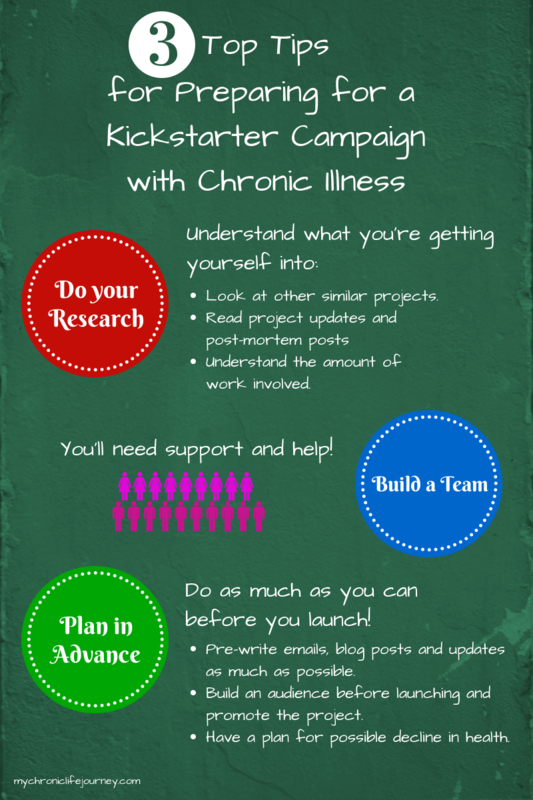 Today I just want to share my top 3 tips for preparing for a Kickstarter Campaign with a chronic illness. These tips are based on my own experience, as well as the extensive research I did prior to and during the planning stage of this campaign. I did a lot of these things prior to launching the Foggy Frog campaign, but there were a few things I didn’t quite get right. These are the things I will focus on when I do a post-mortem of the Foggy Frog Campaign in the next few weeks. I’d also like to note that these tips serve well for planning any event or campaign or even just living with a chronic illness. We should always research and understand what we’re getting ourselves into, plan in advance as much as possible, and make sure we have a support team around us to help when we need it! Right now my focus is on completing the campaign. With $3,219 still to raise in just 4 days it would be great if you could all share the campaign with people you know and encourage them to participate!